ALBEMARLE, VA (WWBT) - A man who has spent more than 30 years behind bars for the murder of a Bedford County couple is getting new support for his release. Albemarle County Sheriff Chip Harding sent a 19-page letter to Gov. Terry McAuliffe asking for him to pardon Jens Soering. Soering is currently serving a life sentence for the brutal 1985 murders of Derek and Nancy Haysom, the parents of his then-girlfriend Elizabeth. Soering, who is from Germany, was an 18-year-old University of Virginia student when the Haysoms were killed. Harding was asked to look at the case by Soering's attorney, Steve Rosenfield. Harding spent more than 200 hours reviewing evidence, transcripts from Soering’s trial, and interviewing Soering himself. "The more I got into it, it just, 'Boom, kind of took me over,'" said Harding. In the letter, Harding admits for years he assumed Soering was guilty. However, once he took a closer look at Soering’s case, Harding says "the evidence appears to support a case for his innocence." "Soering would not be convicted today on the evidence that has since surfaced or was improperly submitted or omitted from the jury," wrote Harding in the letter. Harding feels prosecutors got tunnel vision under pressure to get a conviction. Harding says during trial, the prosecutor cherry picked evidence, like a bloody sock, and shoe prints ignoring that that investigators deemed both were too small to belong to Soering. He says the prosecutor also left out discrepancies between Soering’s recanted confession, and details of the actual crime scene. "Here you've got a kid that confesses. So if I was in the same position, I would have been ecstatic. So you run back and try to corroborate that confession, even if you're reaching. They reached a little too far I think," said Harding. Type O blood found in the Haysom’s home was a centerpiece of the Commonwealth’s case against Soering, who has Type O blood. Harding believes new testing proves Jens wasn't at Haysom home the night of the murders because Type O blood from the scene does not match Soering’s DNA profile. "Now we know conclusively that’s not Jens Soering’s blood. No one is disputing that. That’s an absolute. His DNA is not in the crime scene," Harding said. 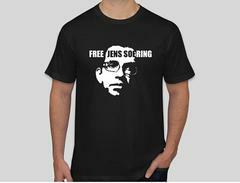 Currently, Soering’s bid for release is before a parole board for the 12th time. "Honestly, I feel scared. I've been in this place before, in this circumstance, where it looked like things were breaking my way," Soering told NBC12 in December. Harding’s letter is believed to be the first time in recent history, a sitting Virginia sheriff is supporting the release a convicted murderer. However, Harding is not the first member of law enforcement to believe Soering may be innocent. Last year, Chuck Reid, a former criminal investigator with the Bedford County Sheriff’s Office, told NBC12 he feels missteps where made during the handling of the case. Both Reid and Harding say details described in Soering’s confession didn’t match what was found at the crime scene. "Seeing things over the years that’s come up, that just really put questions in my head. As an investigator, that’s taken from the point of having my doubts to the point where I don’t think Jens Soering was at the house bottom line," Reid told NBC12 last year. Elizabeth Haysom plead guilty to orchestrating her parent's murders and is currently serving a 90-year prison sentence.